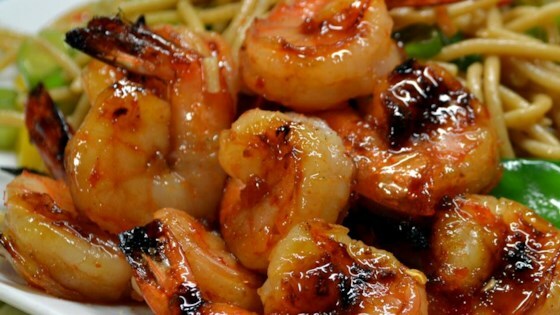 "This is something a little more flavorful for grilling shrimp. This recipe is also delicious brushed onto bacon wrapped shrimp." Stir chile-garlic sauce and honey together in a small bowl. Thread shrimp onto soaked bamboo skewers, piercing through the head and tail ends. Cook the skewers on the preheated grill, frequently turning and basting with the sauce mixture, until shrimp are firm and pink on all sides, about 10 minutes. Like the recipe is written, I skewered the shrimp and then basted, thinking it would be less messy than saucing them and then skewering. These shrimp were tasty and certainly easy to prepare. Easy & delicious! I tossed the shrimp with the sauce - skewered and grilled - no basting - perfect. Thank you. Marinaded for a couple hours but other than that did not change a thing. Simple and delicious!